Picture by SANDY McCOOK 15th February '17 Work by Bear Scotland has begun to clear and stabalise the rock face above the A82 north of Drumnadrochit. Road safety training is being delivered to 120 apprentices and staff in the construction industry in the Highlands to help protect them from dangerous road accidents on their daily commute to work. 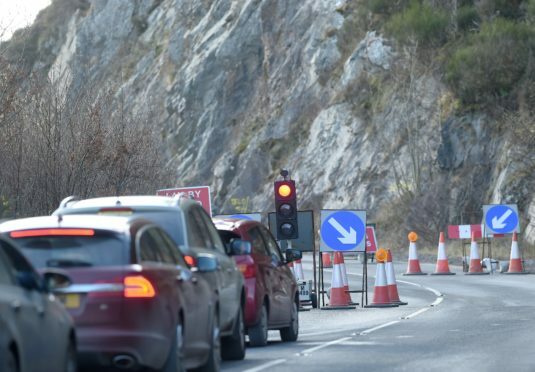 ‘Safe Driving in the North’ is a health and safety focused-event, organised by the Highland Construction Training Group (HCTG) and funded by the Construction Industry Training Board (CITB). The event being hosted today and tomorrow will raise awareness and provide practical training on how to deal with potentially hazardous conditions on major roads like the A9 and the A82. Numerous serious road traffic incidents including fatalities have been reported on these roads, and associated rural roads, due to a combination of speeding and environmental factors over the years. The event will feature talks, workshops and practical training from Police Scotland, the fire and ambulance services, Highland Council road safety and the Scottish Government’s Health and Safety Executive. The main causes of collisions on Highland roads are excessive speed and drivers who are distracted or drink driving. Safe Driving in the North will tackle all of these issues. Ian Phillips, chairman of HCTG and operations director of Robertson Group, said: “The whole point of Safe Driving in the North stems from the need for our construction operations to be on the go early in the morning and sometimes throughout the night. The crowd will hear from Munlochy nurse Rachael MacDonald, who will highlight the importance of road safety by sharing the story of her older brother, Andrew, who sadly died in a road traffic accident in Carrbridge in 2012. She said: “I know that travelling these same roads every day in the North involves risk.